For a New Year’s Eve party that gives you all-around entertainment under one giant, fun roof, head to Times Square NYC’s Dave and Buster’s, a restaurant and bar and a sprawling arcade-meets-entertainment complex. This New Year’s, with free-flowing drinks, bumping music, and legions of game options, Dave and Buster’s is delivering super-charged grown-up action and family-friendly NYE fun to revelers of all ages. Come and play. NYC, Times Square has seen nothing like Dave and Buster’s New Year’s Eve party, where “kids” from 5 to 50 can partake in the electric energy of NYE and the unbridled fun of an fun-emporium. A thirst-quenching 5 hour premium open bar is just the ticket for those 21 and over to get fired up for the night of revelry ahead. Besides mega-sized fun and games, Dave and Buster’s is also rolling out plenty of complimentary goodies for guests of all ages, like mouth-watering buffet appetizers to stimulate the palate. The extensive selection of high-energy games will bring out the kid in you but for the jitterbug amongst you, a live DJ will also be on hand to blast the hottest beats of Hip Hop, Top 40 and Mash Ups. With all the drinks, food, games and music, it’s hard to imagine there could be more good time to offer at this NYE bash, but Dave and Buster’s is pulling out all the stops to make this NYE unforgettable: multiple large screen TVs and projectors will be broadcasting live the Times Square Ball Drop so you, your friends and family can join the electric count down and, for those over 21, raise a complimentary champagne toast to an “ace” New Year. Race to the top of the leaderboard at this all-ages party with one of the many exclusive VIP options: enjoy reserved VIP seating, intimate Couples Champagne Packages for two, or Table and Bottle Services for groups. Times Square, NYC’s Dave and Buster’s is an enormous entertainment hub with an extensive variety of fun-amenities. Encompassing 31,500 square feet of prime Times Square space, Dave and Buster’s is a unique mega-arcade as well as restaurant and bar. Fun-seekers of every age can come and find what they need: with over 200 arcade game machines, advanced virtual simulation games, and familiar amusement park diversions, as well as a renowned restaurant and full bar, Dave and Buster’s is the ultimate hotspot for a good time. With your friends and family in tow, head for the classic Skeeball, exciting NASCAR race simulation game, no-frills Basketball Shoot-out, or simply socialize in a high-energy atmosphere. There’s no wrong way to have fun at Dave and Buster’s. 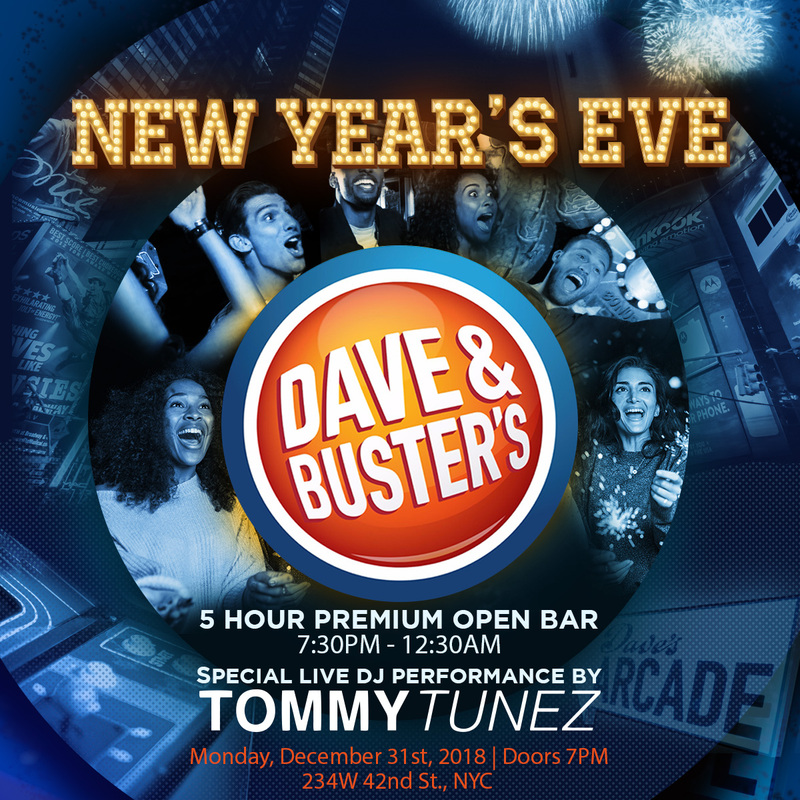 Families, friends, kids young and old: join in the most high-charged and fun-filled New Year’s Eve party in the center of Times Square, NYC at Dave and Buster’s. This fun-fair is the can’t-miss ticket to the most revved-up New Year’s for celebrants of all ages.